Perched on a hill in Oslo, this new single-family house by local firm STA comes with striking long views towards the Norwegian capital and beyond, to the country’s famous fjords and green hills in the distant horizon. Its prime position, high up, at the very edge of the city’s limits and with a dense forest starting behind it, is complemented by its timber architecture that creates a generous, warm, yet typically minimal Scandinavian interior. The site, privileged, as it may seem, didn’t come without its challenges. While it sits firmly within the capital’s suburban zone, a high-density development is located right in front of it, potentially blocking its views towards the city centre. The architects, headed by STA co-directors Stian Schjelderup and Øystein Trondahl, had to approach height and massing carefully, and conducted a thorough analysis of the different viewpoints and the volumes of the surrounding buildings, in order to ensure the best possible experience for their clients. The geography of the site and strict building regulations determined the form and height of the house, but also its colour. The structure’s tall form is clad in slow-grown, handpicked, burned and oiled spruce board that conceals all the fixed window frames within. A vibrant yellow highlights some of the irregular openings that break the monotony of the façade. The street-level entrance is situated on the building’s middle floor, which compactly houses four bedrooms and a bathroom. A short hallway leads diagonally through to a family sitting room. Downstairs from this level, on the ground floor, are a series of service rooms and a small studio apartment with independent entrance, living area and access to the concrete terrace on the garden. 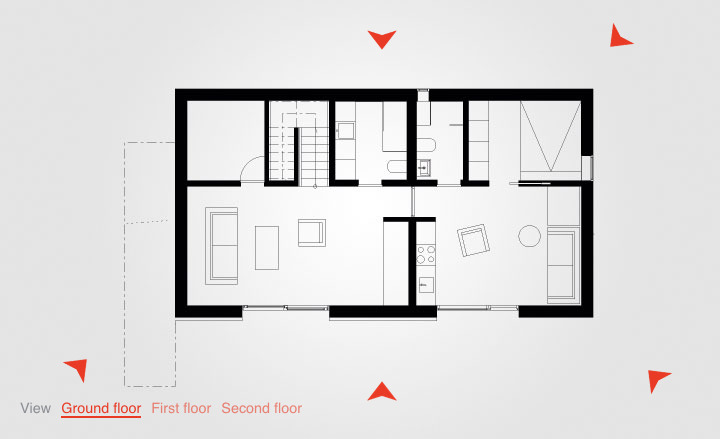 At the building’s very top sits a generous open-plan living area, including the kitchen and dining room. The roof’s angle and internal timber cladding (solid oak floorboards and plywood wall panels) help create an intimate atmosphere. A terrace jutting out from the building’s side, like a bridge toward the horizon, gives the owners the chance to take in the stunning views al fresco.